I am about to complete an almost 3-week trip to France; the country where I was born, and where several of my lives have begun. 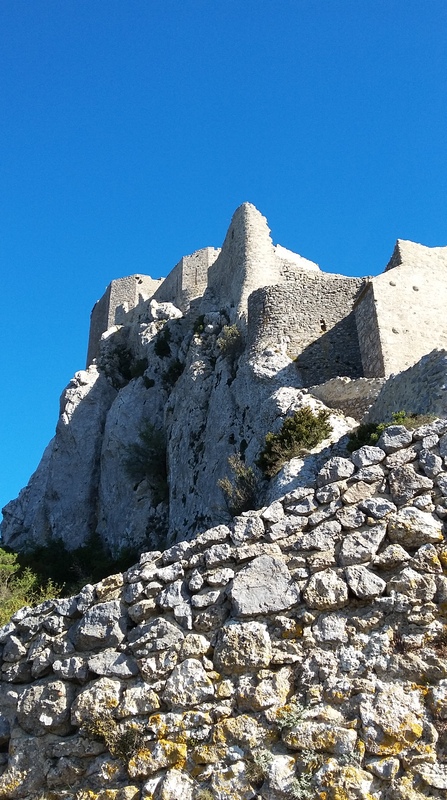 It is a good time to reflect on what I seeded, and what I harvested, knowing part of my trip was aimed at reconnecting with a region of the south of France charged with history and tragedy: the Cathar country. My sojourn in the south was brief and yet tumultuous if I keep adding the kilometers—the spiritual ones as well! In four days, we covered Montségur, Rennes-le-Chateau, Espéraza, Rennes-les-Bains, mystical Bugarach, and even further southeast, on the last day, Cucugnan and his famous priest, Queribus and Peyrepetuse. These are places I knew long ago, and yet the remembrance that I experienced was very dim, to say the least. “Why was it so?” I asked myself for a few days, before turning away from the question, thanks to the advice of my friend Linden. I knew, somehow, that the answer would come. Yet, I couldn’t push away the strange feeling I had when I left the land on October 11: coming from so far way to (seemingly) experience so little. Yet again, part of me deep down knows that something has been accomplished—something important, similar to setting up a keystone in a beautiful edifice. It may not bear fruits in the near future, but it will influence the course of what needs to happen, at the right place, in due and fair time. As I embarked on my reflection this evening, I discovered a beautiful poem about the Church of Love, professed by the Cathars, folks working silently to establish a peace-loving, egalitarian society. This poem didn’t fall on my lap by accident as I started to write about my journey. et par cet état d’être, à enrichir. dont nous sommes tous une partie. dans un retour volontaire dans le Tout. Its members will practice the truth of Love with all their being. It [the church] doesn’t seek to teach, but to be, and by this state of being, to enrich. It acknowledges the whole planet as a single Being, of which we all are a piece. It acknowledges the fact that the time has come for the supreme transmutation, the ultimate alchemical act of changing the world’s ego in a voluntary return to the Whole. This supreme act of alchemical transmutation starts—and continues—with each one of us, within, purging and purifying what needs to be tended to and, just like a great river, leads us into the ocean of the Whole; the place where we all belong, knowingly or not. For one thing, during the course of this trip, I witnessed and savored other beings’ healing or rejuvenation, and felt immense gratitude for the progress they made. Their progress is indeed a benefit to us all. I witnessed it in people close to me—my brother in the first place—and I could not believe the change I saw in him, in terms of emotional maturation and the removal of some old “family baggage.” The change was drastic and my brother’s enthusiasm felt genuine. Openness about his healing path, his struggles, ensued. In my case, as I reflect back with a few more days behind my back, I realize that this act—my act—of alchemical transmutation has presently to do with death and dying—dying to what needs to be left behind, like an old skin or useless shell that no longer serves the purpose it did serve in the first place. Symbols of death were all over the place and they kept recurring after I left the land of the Cathars. What surprised me the most, and caught my attention, in two of the churches I visited was the presence of a skull. 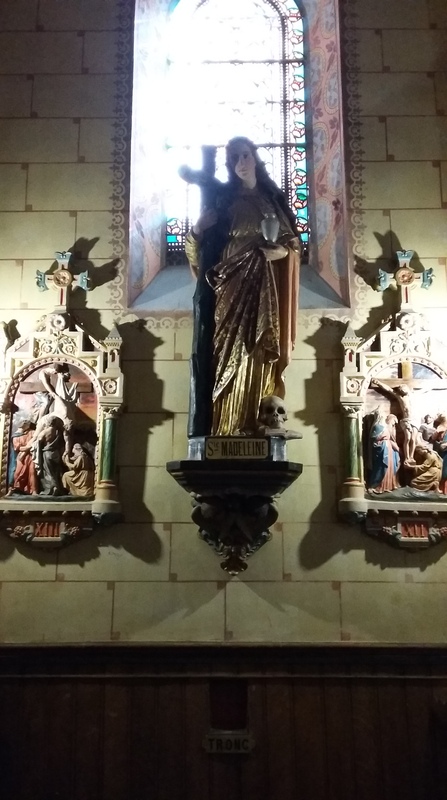 A skull in the church of Rennes-le-Chateau, right by the left foot of Mary Magdalene, and a skull in another church, in Espéraza, at the bottom of what looked like an altar. I understand that a skull might signify the influence of the occult, but why would it manifest in two Catholic churches, and why would I be driven to notice its presence so vividly? 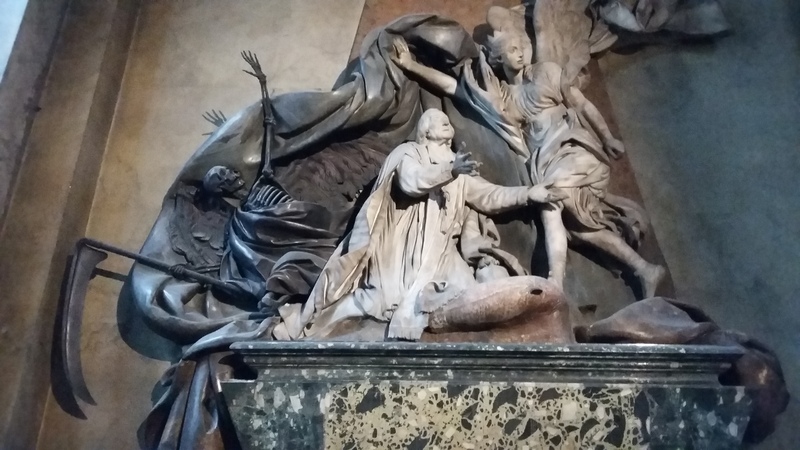 As I walked into the Parisian church of Saint-Sulpice earlier this week, I was struck by the material, solid presence of Death next to a statue of a former leader of the said church. He had passed at the age of 76, after dedicating over 10 years of his life to the revivifying the church’s mission—with much success—and was eternalized in a statue, looking up at what seemed to be an angel. But why is it that Death got such a huge positioning in the whole affair? 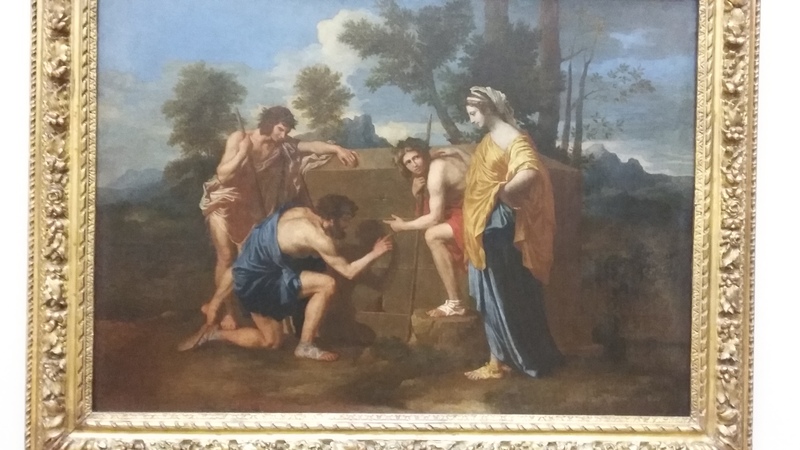 That same afternoon, I visited The Louvre museum to finally see and examine Nicolas Poussin’s painting “The Shepherds of Arcadia.” I had been researching and reading about the inscription that intrigued me much during the past three months, with the three shepherds looking at it: “Et in Arcadia Ego.” By The Louvre standards, this sentence got interpreted as, “Even in Arcadia, I, Death, Exist.” An interpretation unknown to me till I admired the painting. Finally. Toward the end of my visit at the museum, I visited an exhibit of French statues. 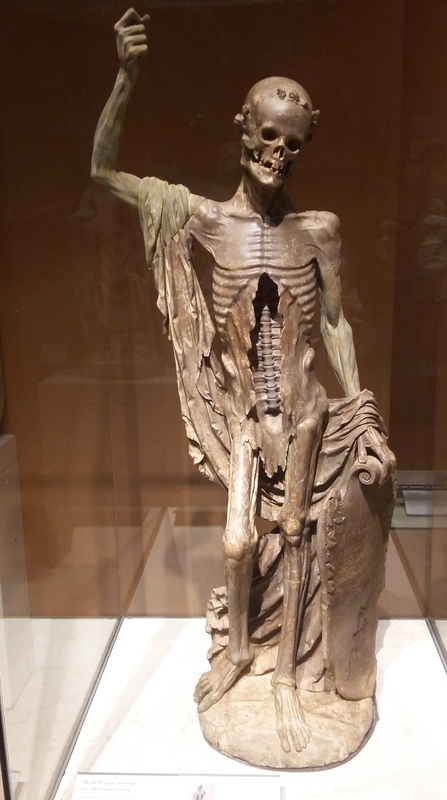 One statue that once resided in the ‘defunct’ Parisian cemetery of Les Innocents was coined, “La Mort Saint Innocent.” A partially skinless, fleshless representation of Death. It was the last of my “Death signs,” and possibly the most potent. Why is it that death became so prominent on my path, I shall ask, from the south to the north, and what is indeed in the process of dying? The death of an old and stubborn ego, perhaps? Signifying the clearing of the land for a new ‘piece of life’ to take place. Indeed, that interpretation of mine was confirmed in a conversation I had two days later with one of my spiritual guides, Master Djwhal. The passage from one world to another, and the age that comes with each of them, is indeed significant. The Aquarian Age will not manifest fully until some months or possibly years down the road; yet its manifestation requires of us that we clear our spiritual plate, so to speak, so that the new can be grafted onto a virginal—read purified—terrain. This is by far an unconscious, subtle process; yet signs along the road can help us understand the symptoms that sometimes manifest in the body as well; be it the physical, emotional, or mental body. Nights have been stranger than usual in my case, with a total absence of communication from my subconscious, and it makes me wonder at what point it will once again be able to communicate with the conscious part of my being—through mystical, meaningful dreams. Again, what needs to happen for this process to take place? What kind of inner transformation—alchemical if you will—needs to be engineered in the depth of my soul? While I am not fully aware of what is slowly shaping up, I can certainly listen and make every effort to Stand in My True Power (Révéler Ma Vraie Nature – To Reveal My True Nature, as in the title of the tape I listened to this evening at my brother’s). Standing in Our True Power happened to be the title of my radio show on October 22nd, Nurturing the Spiritual Spelunker in All of Us. Once I stopped asking the question about my reason for coming to the land of the Cathars, and my apparent lack of harvesting, the inner space I generated started to resonate with true purpose, and genuine concern for what might appear next on my path of service to Humanity: Standing in My True Power, designing classes for men to enhance their connection to the Divine Feminine, and making my offering known to whomever would like to benefit from it. This, I believe, is the reason for our being, and the reason for making yet another trip to planet Earth in this lifetime. Please Stand in Your True Power! Addendum: I wrote this article a few days ago and there is one thing I realized about my trip to the South. Because of a missed connection in Munich, I arrived later than expected in Toulouse that Tuesday. By the time I drove to Cathar land, it was dark and the heavens were pouring rain on us. Conditions were similar when I left the land, meaning daylight had not yet broken that Sunday morning. Yet that ‘second darkness’ was bringing a message of Light and Hope as it was soon going to make space for a bright, sunny day. An uplifting darkness. This entry was posted in My Personal Path and tagged death, dying to oneself, life light love, Mission, reading the signs. Bookmark the permalink. Merci à toi, pour ce beau texte. Ce cheminement intérieur, à travers les morts/renaissances successives, nous est nécessaire car comment évoluer, sans se défaire de nos « vielles peaux » ? Merci, chere Elisabeth, pour ta presence et ta compagnie au cours de ce long et beau cheminement. Voyons voir ce qui va suivre…cela pourrait nous surprendre, qui sait!